An email cover letter is essentially a job application email through which you apply for a job. The email must contain your cover letter, either in the body of the email or as an attachment, and your CV as a separate attachment. With the massive technological boom over the past decade, we have seen the dramatic rise in email applications. Sending an email is free, it doesn’t require a stamp, visit the post office or a trip to the company you’re applying for. It all happens within seconds and with just one click of a button. In this guide, we will mainly focus on applying for jobs that have already been advertised. However, read on as there are also tons of tips and examples for those who wish to inquire about job opportunities via email. 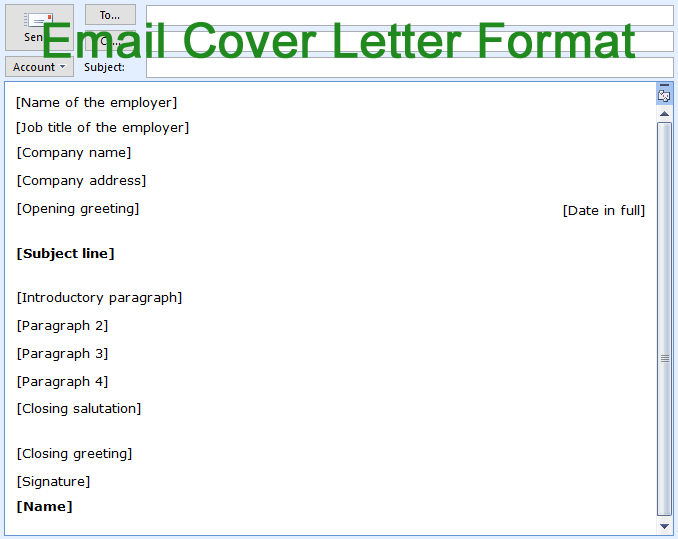 The format of an email cover letter slightly varies from the format of a standard cover letter. For example, there is no need to include your personal details such as name and address on the right side of the letter because your attached CV will already contain all this information. Moreover, it will take up valuable space. Before working on drafting your email, make sure that you have already written and prepared your CV and cover letter. 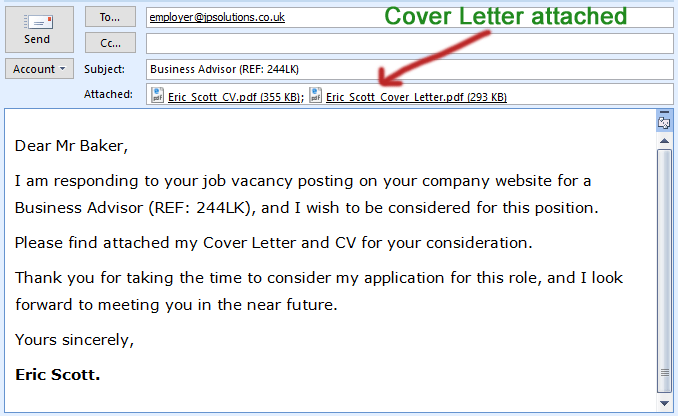 Check out How to write a Cover Letter and How to write a CV guides for more tips and examples. The job application process is a formal process. As such, you have to have a formal approach to writing your email job application. You can find more information on formal writing here. You must use a professional email address when contacting the recruiter. You only have one chance to grab the attention of the prospective employer, so keep the letter short and to the point. Employers only tend to scan CVs and cover letters for less than a minute. Anything longer than a single side of A4 will most likely not be read or considered. Why take the chance? You will have plenty more opportunities in the later stages of the recruitment process, including during the job interview, to fully impress the prospective employer. It is highly recommended to write your letter in a separate Word document first rather than typing it up on the actual email client in one go. This is because there will be a smaller chance of losing your work because of the loss of internet connection or the software crashing in the middle of writing your letter. It also gives you additional time to properly check your written document for grammar and spelling mistakes. If you decide to add anything extra, e.g. including your name or a short message, please keep it short as there is a limit on how much of the subject line will be shown to the recruiter when they receive it in their inbox. You come over as either too desperate or too aggressive. In the worst case scenario, you come over as both. QUESTION: Should you write the cover letter in the body of the email or send it as an attachment? Some employers prefer attachments, whereas others prefer the letter in the body of the email. Please check for company requirements on the job advertisement. If the company has not specified their preference, it is up to you how you’d like to send your cover letter to them. If you decide to attach your cover letter separately to the email, always write a short message in the body of the email introducing yourself and giving the reason for emailing the recruiter – don’t leave it blank! Please find attached my CV and Cover Letter for the position of Senior Research Fellow. This is the most popular way of sending an email job application. I can already hear you ask “which one is better?” glad you asked. Our recommendation is to write the cover letter in the body of the email. It gives the opportunity to make a strong and memorable first impression, allowing you to grab the prospective employer’s attention within seconds. If you send it as an attachment, on the other hand, the employer has to take the additional step of finding and opening your letter in order to read it. Some recruiters will not open attachments out of fear of infecting their computers by viruses. Warning: Don’t include the same cover letter in the body of the email and as a file attachment. That is just a weird thing to do and makes you look very indecisive. “Dear” followed by their honorific title (Mr, Mrs, etc.) and surname. It’s always best to find out the name of the employer to whom you are written the letter. This makes the letter more personal and convincing. If you’re addressing the employer by name, only include their surname (Dear Mr Kent) and not their full name (Dear Mr Simon Kent). The next line should include today’s date in full (10 November, 2018 instead of 10/11/18), aligned to the right. State the reason why you are writing this covering letter. I am writing to express my interest in the Electrical Engineer role listed in The Worcester News, 19th of March 2017. After carefully reviewing the job requirements, I feel I have all the necessary experience and technical skills to excel in this position, and I would wholly appreciate your consideration. These are the first few sentences that the prospective employer will be reading about you; make sure the introductory paragraph is short, to the point and is written for high impact. In this paragraph, clearly outline the reasons why you would be a suitable candidate for this position. Make mention of your relevant education, qualifications, work experience, strengths, skills and abilities. Following on from paragraph 2, expand on more reasons why you would be the ideal candidate for this job position. I graduated in 2015 with a 2:1 degree in Business Management from the Queen’s University Belfast, something which kindled my passion for business and the economy. I studied a broad variety of topics ranging from Marketing Principles and Corporate Responsibilities to Leading Change and Strategic Management. I am a driven, ambitious and analytical individual with the excellent ability to analyse current business operations and offer meaningful solutions based on the findings. This is going to be the final information-packed paragraph of your cover letter. Mention any other selling points that you have and state the reason why you are interested in working for this particular company. Do research about the company you are applying for and use your findings to draft this paragraph. This will make you look interested, intelligent and resourceful in the eyes of the prospective employer. The final paragraph is usually a polite call for action in which you state that you are looking forward to meeting the prospective employer. It must also contain a reference to your CV that you have attached with the application. Please find attached my CV for your consideration. I have attached my CV with this email. For your consideration, my CV is attached with this email. The closing greeting should be “Yours sincerely” only if you addressed the employer by name (e.g. Dear Mrs Sanders) at the beginning of the letter. Sign off the letter with a signature followed by your name. That is it – you should now have a perfectly written email cover letter! Don’t rush by writing and sending your email in one go – you will most likely forget to include important things or make many factual, grammatical or spelling mistakes. Write a draft version first, take a break, and then come back again in a few hours time to review it. Don’t forget to attach your files! You only have one chance to make a good impression, make sure you don’t mess it up with clumsy mistakes. Send a test email to yourself first to double-check the email’s format and whether attachments can be opened. Shall I send my documents in Word (.doc or .docx) or PDF format? Both methods are acceptable. However, we recommend you send it as a PDF file because that will preserve the format and presentation of your documents; including margins, padding, spacing and indentation. How do I find out if my job application email has been received? Unfortunately, you can’t be sure whether the employer has opened or read your email unless they tell you so. Some email clients allow you to ask for a “Read” receipt after the sender has opened your email. However, you will only receive a “Read” receipt if the recipient decides to send you one. After how many days shall I follow-up my application? Most job vacancies will state the timeframe in which you should hear back from them if you have been shortlisted for an interview. Many job vacancies will state: “If you do not hear back from us within 2 weeks time, please assume that your application has been unsuccessful this time.” If, however, this is not specified you should get in touch with them after a week to follow-up on your initial application. Should I use the “high importance” flag when sending my application? No, not really. The high importance flag has lost its value years ago. Besides, there is a chance that you will come across as rude as why should your job application email be more important or urgent than those of other senders? More than 90% of emails are sent without one.